The United States’ top public school official is under fire this week after a brutally icy interview that aired over the weekend on national television. As CNN reports today, U.S. Education Secretary Betsy DeVos “stumbled her way through a tense interview on CBS’s “60 Minutes” Sunday night, struggling to answer some basic questions about schools in her home state of Michigan and admitting that she does not ‘intentionally’ visit underperforming schools. “60 Minutes” correspondent Lesley Stahl asked DeVos if in Michigan, students who can’t afford to leave public schools are thriving, as the secretary cites. “Have the public schools in Michigan gotten better?” Stahl asked. White House officials watched the interview, along with media appearances DeVos made on Monday morning, with dismay, two sources familiar with their reaction told CNN. The White House did not respond to a request for an official comment regarding DeVos’ performances, and it wasn’t immediately clear what President Donald Trump’s reaction was. The secretary also argued that the federal government has “invested billions and billions and billions of dollars … and we have seen zero results” in public education. “But that really isn’t true,” Stahl argued, noting that test scores have gone up over the last 25 years. DeVos said the United States has comparatively stagnated with test scores, pivoting again to school choice as the solution. DeVos’ passion for school and community choice also transferred into how she views school safety. The secretary said allowing teachers to have guns in schools “should be an option for states and communities to consider,” later reconciling that she “couldn’t ever imagine” her own first-grade teacher brandishing a weapon in the classroom. 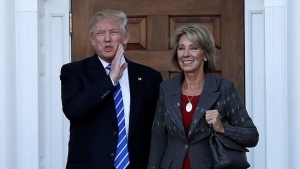 This weekend’s interview marks another rocky moment for DeVos, a longtime GOP booster and school choice advocate chosen by President Donald Trump last year to lead the U.S. Department of Education. Predictably, the “60 Minutes” interview spurred a steady stream of criticism and some defense of the education secretary on social media, as well as this cutting analysis from The Washington Post. Just watched the whole @60Minutes piece on Betsy DeVos. Pretty rough. @LesleyRStahl seemed to know more about the nation’s public schools than the education secretary. The way the media & left treats Betsy DeVos is disgusting. She is a smart, humble, and strong woman that is working for better education for our children. USA is better with her. ? ?